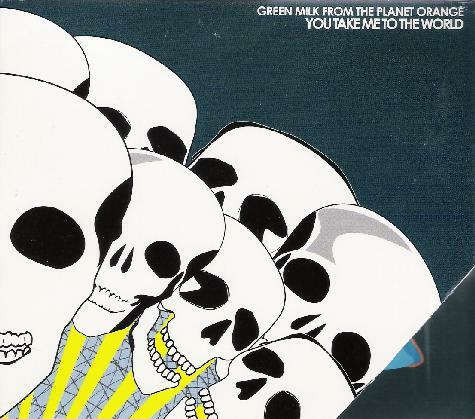 Green Milk from the Planet Orange - "You Take Me To The World"
Japanese psychedelic genre benders Green Milk from the Planet Orange (GMFTPO) are back with their third album on the Beta-lactam Ring label, and what looks like their fifth overall. You Take Me To The World consists of two tracks, totaling just under 31 minutes of music. I have to confess I struggled with this album, even after several listens. I was very impressed with 2004's He's Crying Look" for it bold and adventurous, though not always successful, attempts to blend psychedelia, space rock, metal, hard rock, experimental jazz, and electronics. And 2005's City Calls Revolution was a completely mind blowing set of high energy, acid drenched, power prog-psych that was one of my favorite albums of that year. "KillmeKillmeKillme" is the first track and is an out-jazz/avant-rock piece with quirky rhythms and ranting vocals. The promo sheet makes reference to La STPO but I don't hear it here. And when after nearly 7 minutes it comes to an end I felt like they had taken the germ of a good idea and not done much of anything with it. The 24 minute "Away" is the second track and I really had to force myself to stop comparing it to the other albums. It starts off very sparse… very subtle… a sound-art piece with spoken word and voice effects, experimental spacey sounds, electronics and percussion. It fumbles along for a while, with transitions that include near silence at times. But getting near the 8 minute mark the band start to tease as the guitar, bass and drums start to kick up a bit of lazy paced, bluesy rock n roll jamming. Things plod along for a while until another spoken word/sound-art section comes along and now I'm getting bored, until they crank it up again and launch into a hard psych-rock and stoner jam in some ways reminiscent of City Calls Revolution. All well and fine but by this time there was only several minutes left and I was completely confused as to what they were trying to accomplish. So I'm really not sure what to make of GMFTPO. They've demonstrated a serious sense of creative enterprise, truly progressive, and even have the ability to be downright phenomenal. I'd recommend getting He's Crying Look and City Calls Revolution as those are excellent companion albums that demonstrate what the band are capable of. Then if you agree you can check out You Take Me To The World and judge for yourself. But this is definitely not the place to start with GMFTPO. For more information you can visit the Green Milk From The Planet Orange web site at: http://www.green-milk.com.